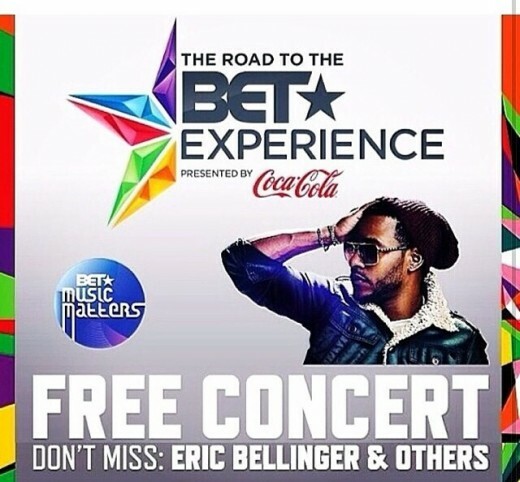 #BETExperience Free Concert with @EricBellinger @Sevyn Streeter @IAmRicoLove @MackWilds @KarinaPasian! BET Experience is live and effect and I am looking forward to getting my party on at the Free Concert staring Eric Bellinger, Sevyn Streeter, Rico Love, Mack Wilds, and Karina Pasian. I am having the time of my life at the 2014 BET Experience and the good times and good vibrations extend to the free concert this afternoon at the Nokia Theater located in Downtown LA. The amazing show will feature some of the hottest talents in HIP HOP/R&B/POP. I can’t wait to see the homies Eric Bellinger, Sevyn Streeter, Rico Love, Mack Wilds, and Karina Pasian. The concert that’s FREE. You can’t help but love and appreciate FREE will take place at the Main Stage South Hall at the Convention Center. BET is bringing it this year when it comes to the talent and I can’t wait for you all to see the good times that is going to take place tomorrow for the LIVE BET AWARDS. They really bringing it and i am just so happy to be here to experience…..#BETEXPERIENCE. If you are in the area or in the state of California LOVE you need to make your way down to the the Nokia Theater in Downtown LA. If you are in ATLANTA or another city just follow the conversation on social media by following the hashtags #BETExperience, #BETAwards, and @FreddyO. Eva Marcille Hosts Private Screening of Universal Pictures’ LUCY in LA with Omarion, Jo Jo, Verse Simmons, Kyla Pratt, Eric Bellinger and More!